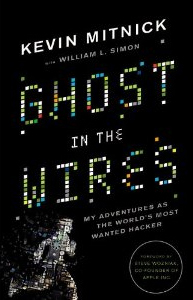 Reading Ghost in the Wires by Kevin Mitnick. Absolutely mesmerizing account of simple and effective social engineering exploits. glad you liked it. Please put your comments on Amazon for me. surely I will. Also will purchase some of your other books. Also, please don't steal any of my digital identity stuff, k? …and as it usually comes to pass I then imagined the whole of my twitter following offering up a rowdy “har-dee-har-har” and I got back to work. … and then I started to get deeper into the book. … and I started to get a feel for the raw deal that Mr. Mitnick has received. … and I thought back to my attempt at humor (see the underlined portion of my last tweet, above) and realized with some statistical certainty just how many times Mr. Mitnick has had to endure crap like that from rubes like myself. Hey, I’m under no illusion that my comment had any effect on the man. However, an apology is in order, if only to serve as a self-reminder not to tweet without thinking. I sincerely apologize for my off-hand and thoughtless attempt to be cute. The only rectification I can offer is a promise to apply more mental processing to my tweets from this point forward. If it’s any consolation, the overly-intimate relationship between corporate IT policy and law is something I think about quite often. … and occasionally blog about. … and try to avoid altogether really.